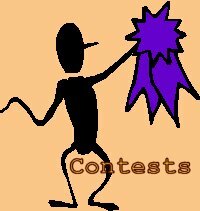 In celebration of the coming Holidays, the first ever contest for this site will be held!!! The prize? There will be two. One is a personalized year 2002 calendar, and the 2nd prize is going to be either a CD compilation of the Boys Be OST, a CD compilation which contains 2 episodes of your choice, or a VHS tape chock full of all 13 episodes of Boys Be... taped from AXN (remember that the videos and OST are for home/personal use only and are not for sale or for rent). I'm still trying to decide which of the three will be the second prize. I need your help in figuring this one out so I'm gonna place this in the polls. Whichever of the three suggested prizes gets the most votes, will be the one given out for the contest. The poll will be open for only about two weeks so please make sure to vote. As a note, the VHS tape is in Extended Play format, so the quality isn't very good but needless to say, it is tolerable.